It’s no wonder that more than 70% of our Learn To Dive students go on to complete their Advanced Open Water certification within months of completing their Open Water course. You see, the “Learn To Dive” program is designed to do exactly what it says – teach you to dive. The Advanced program teaches you the activities of diving – you know, the fun stuff! On a Saturday morning (after a little previous home study) you’ll meet with your instructor to review the five areas of knowledge that you’ll be covering during the course. After a quick lunch you’ll be preforming your Navigation dive. By the time we’re through you’ll truly be the master of the underwater compass, not the other way around.That same afternoon you’ll get to dive one of your elective dives. Most students prefer to do a Photography session, a Dry suit dive, a Search & Recovery dive, or if we’re in the Caribbean you might choose a Underwater Naturalist experience. If you choose, that evening we’ll do a Night dive in the ocean! Now, that may sound rather spooky at first but let me assure you that years from now you’ll look back on this dive and know it’s when you really fell in love with diving. The next day you will be headed for Monomoy Island or Martha’s Vineyard. Our first dive of the day will be your Deep dive. With Master Instructor Don Ferris, right next to you we’ll dive to a depth of 100′ feet. Man, will you be pumped! After moving the boat we’ll do our next dive on a turn of the century shipwreck. Imagine exploring an old passenger steamer, or a four-masted wooden sailing schooner. You’ll get to look for artifacts and lobsters! Congratulations, you’ve just earned your Advanced certification. The world of diving lies open to you! *Note Junior Advanced Diver now availible for ages 12 -15 years! This course is no pushover. 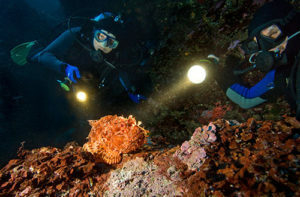 You’ll work, dive and study hard, but when you are through, you’ll experience a wonderful feeling of diving confidence. Training Fee: $550, private lessons includes . . .